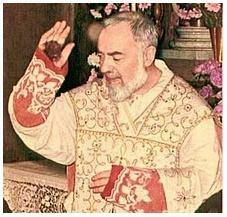 Padre Pio, giving the blessing at Mass with his stigmata on his hands exposed. Happy Memorial of St. Padre Pio of Pietrelcina to you today! Born on: May 25, 1887 and died on: September 23, 1968, Padre Pio is certainly a saint of our age! Padre Pio was known widely for the miracles that have occurred both before and after his death. He was known to have been able to bi-locate (be in two different places at once), he received the transverberation of the heart (a theological mystery in which his heart and soul felt the same pain that the Crucified Christ did as he endured his passion), and he received the stigmata (the wounds of the crucified Christ). One of the greatest gifts that Padre Pio had bestowed on him by Christ though was that of being a great confessor. People would line up and fight, just to be able to have him hear their confessions. Why is that? St. Pio was known for his gift of being able to reconcile the soul to God, help them to make a true confession, feel sorrow for their sin, but also feel the immense mercy of God. One of the priests who inspired me to join seminary told me: “God-willing if you become a priest, always, ALWAYS, be merciful and generous with your time in confession. Always be willing to hear the people’s confession, for it is in confession that we can save souls.” This priest always had people flocking to him for confession, because he was known to be joyful, both in and out of the confessional. In a sense Padre Pio’s quote I started with stood very true with this priest, but it can also be said true of us today. “Joy, with peace, is the sister of charity. Serve the Lord with laughter. ” Pope Francis said that the church needs “happy Christians.” It is our duty as Catholics to welcome all in joy, peace, and love. To live out our faith with happiness, always being aware of God’s immense mercy and love, but being able to recognize our mistakes and that we are human.